Fransabank has launched the WeDesign competition to “facelift” its headquarters: a building designed by the famous architects Alvar Aalto and Alfred Roth. 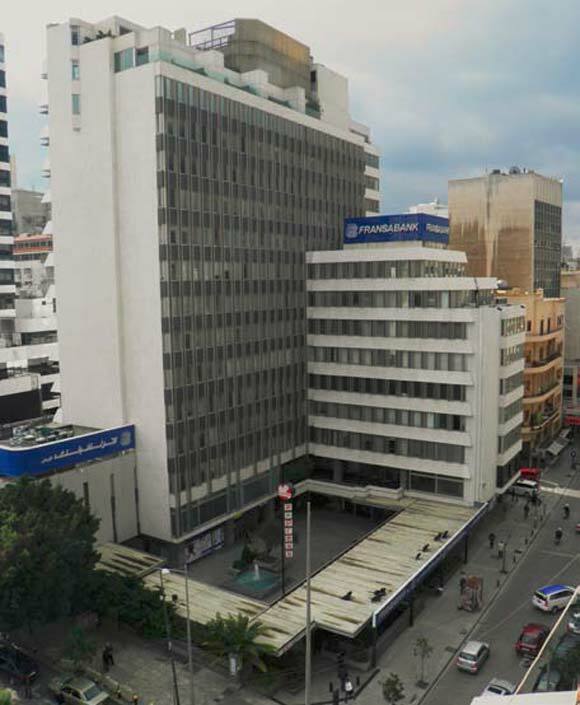 It is one of the great legacies of the Modern architectural movement in Lebanon and is located at the beginning of Hamra Street in Beirut. I submit to you that this is a crime in the making! The above statement, particularly the fragments “looking for creative proposals” and “remaining loyal to the original architects’ spirit”, clearly indicates that the intent is a transformation of the building façade and plaza. A “facelift” implies restoration, repair, or reconditioning and that does not require a competition, certainly not a student competition. “Building restoration is the action or process of accurately revealing, recovering or representing the state of a historic building, as it appeared at a particular period in its history, while protecting its heritage value.” Wikipedia. A restoration is typically conducted by a professional who is an expert on the matter. Her or his work would be limited to “reverse decay, or alterations made to the building(s)” over the years. A body such as the ACA (Arab Center for Architecture) or APSAD would be one apt to manage such a restoration, in collaboration with the OEA (Order of Engineers and Architects) who could regulate this undertaking. This is clearly not a task to be conducted by architecture students. This charade was called a competition in an attempt to legitimize the sinister end to the work of a hero of modernism and one of the most famous architects of the 20th century! To put it in perspective for non-architects, this is equivalent to someone proposing to alter a painting by Picasso, Matisse or Brancusi, and to add insult to injury, to have the alterations proposed by a student. Such a suggestion would understandably be greeted as heresy and heads would roll, universities would refuse to allow their students to participate, faculty would speak out against it, the press would attack and ridicule and the entire art community would mobilize! Today, the Alvar Aalto Medal is considered one of world architecture's most prestigious awards. He was featured on the Finnish national 50mk bank note and on a postage stamp. There is a University named after him, and you can find streets that bear his name in five different Finnish cities: the capital Helsinki as well as Jyväskylä, Oulu, Kotka and Seinäjoki. We as architects have studied him during our education in history courses and have used his works as precedents in our research and our work. What message are we sending to the world and to our students? Are we telling them that it is acceptable to deface the work of an icon of modernism? At a time when radicals such as ISIS are going around burning books and destroying cultural treasures shouldn’t we be encouraging respect for such singular works. To be constructive, I suggest that Fransabank has far more to gain by proceeding with a simple restoration and rehabilitation of the façade and offering Lebanon and the world a forgotten treasure of modern architecture. Such a deed would go much further to put forth evidence of a cultural savoir-faire while conducting a successful marketing campaign. They could pair up with the ACA to provide tours of the building as part of the center’s existing guided tour program and bolster their own visibility while serving the public. Architectural heritage is more than old stones, some buildings may be very old but worthless and others may be more recent but national treasures. This is one such treasure, let us help preserve it! Bernard Mallat, Beirut, March 3, 2015. #WeDesignFransabankHQs competition is about connecting students with an impressive example of modernist architecture in Beirut that they may not have been aware of and about connecting with the great Aalto….We are inviting students to visually and conceptually connect with the building and come to know our impressive headquarters – a true Beirut landmark that is a treasure and that we are very proud of. By involving students in the competition, we are showing them our confidence in their creativity and potential and giving them the opportunity to study in greater depth the work of Aalto. We have invited these students to come up with conceptual ways to enhance the look of the building and plaza without any change to the original structure. Fransabank believes in the students’ work and are giving them the opportunity to work on a famous project, a landmark. Should you have any queries or require any further information please contact Raida.Daouk@fransabank.com.